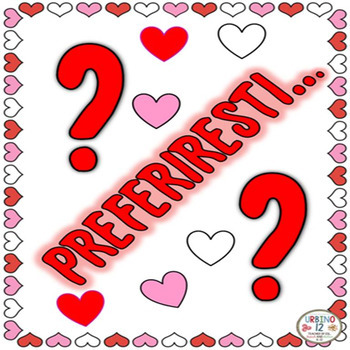 These 20 San Valentino themed "Would You Rather Questions" in Italian (Preferiresti?) are great to use as a warm up with your students. Perfect for a paired speaking activity. Students simply read the questions to each other and check off their responses in the heart provided. They can also be used as writing prompts for the holiday.